The military business, specifically the U.S. Military, has been a stable and growing vertical market over at least the past seven years. Satellite operators have spun-off government entities to serve military and government customers more efficiently, and these divisions account for a growing revenue stream with little sign of slowing down. Increased military bandwidth requirements over the long term lead to a question of deploying more satellite capacity in order to support a relatively stable business, yet satellite operators have not taken risks even when the Pentagon has indicated that it cannot be self-reliant until at least the year 2020. The move is understandable given that longer term military contracts are hard to come by, unlike the video markets where transponder capacity is signed over the long term. On the military side, a seemingly growing bandwidth crunch has led to plans to increase deployment of proprietary satellite assets, which cost in the $billions. Programs such as Wideband Global Satcom (WGS), Advanced Extremely High Frequency (AEHF) and the Transformational Satellite Communications System (TSAT) have been slated as budget line items to specifically address the growing bandwidth needs of the U.S. Military. However, budget processes are oftentimes arduous and protracted in justifying procurement of such assets, particularly during times when governments are faced with other seemingly more pressing issues such as financial bailouts in order to restore the health of ones economy, if not the entire global financial system. Consequences of budget processes inherent in government procurement lead to delays of programs, reduction of the original capability of programs, or the outright cancellation of such programs. However, as requirements for war fighting that inherently incorporate next-generation systems like communications-on-the-move (COTM) capabilities need to become more integrated in a defense network umbrella, delays, cutbacks or cancellations impede or even handicap a nations ability to project power. An idea that has been regularly discussed in light of budget considerations is to host a government or military payload on a commercial satellite. Dual-use programs for use by both commercial and government clients have actually been in existence and have worked quite well for other governments like Australia and South Korea. Will hosted payloads or dual-use satellite systems work just as well for the U.S. Military, the largest government entity that uses commercial satellite bandwidth? Reliance on commercial satellite assets is now a foregone conclusion and will remain a key component of U.S. and international government/military strategies for the foreseeable future. 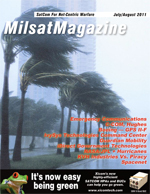 Commercial satellite operators, specifically Intelsat and SES Global, have accounted for some 80 percent of U.S. Military leases and their government arms, Intelsat General (IGen) and SES AMERICOM Government Services (AGS), respectively, see continued growth in both transponder uptake and revenue streams for managed services over the near term. But, as mentioned above, even with admission from the Pentagon that a bandwidth gap exists and is likely growing, Intelsat and SES have not disclosed plans to launch capacity covering some of the globes hotspots such as Iraq and Afghanistan. Once again, government procurement as seen historically is unlike video customers that sign leases over the long term. Interviews by NSR with both operators point to the fact that the U.S. Government seems to be more open to a closer partnership. Whether these discussions lead to long term leases or perhaps even to joint efforts to launch satellites with hosted payloads will depend on contract vehicles over the next few years. In other developments, XTAR, a private entity and a program that carries X-band transponders, is being used by governments exclusively. The fixed and steerable beams on two payloads support military, diplomatic and security communications requirements. X-band capacity on XTAR has been available since 2005, and it was awarded a contract by the U.S. Department of States Diplomatic Telecommunications Service Program Office (DTS-PO) to provide X-band communications services to embassies and consulates in Africa and Asia. However, the U.S. Military has not taken up capacity as quickly as many expected. But in October 2007, XTAR received a contract from the U.S. General Services Administration, where an unlimited spending ceiling may be used by any federal, state or local agency to acquire XTARs X-band bandwidth and services. Militaries and civil government agencies have outsourced bandwidth requirements on traditional commercial C- and Ku-band transponders, as well as X-band, that fall under the exclusive use of non-commercial customers. In the future, commercial Ka-band transponders are expected to be used more extensively by government customers as well. The growth of commercially outsourced bandwidth has been steady since 2003 for both U.S. and non-U.S. government users. As applications and communications requirements grow over time, commercially outsourced bandwidth should continue on a positive growth track as well. But by far, the largest user of commercial bandwidth has been the U.S. Military and although commercial assets have been available for their use, control of these assets as well as security requirements may not be at the level that the U.S. Military may be used to. And therein lies one of the challenges on being too reliant on commercial capacity. Coupled with the costs and budget considerations in deploying proprietary assets, the case for dual-use or hosted payload solutions become more compelling as an option for the U.S. Military. Optus uses C1s Ku-band payload to distribute video, DTH, telephony and Internet connections to remote areas. For the Australian Department of Defense, the satellites Ka-band payload provides high-data rate broadcast coverage for video, voice and data communications. The satellites X-band provides medium-to-high data rate voice and data for land and maritime applications. And finally, the UHF payload provides secure low-rate voice and data communications to mobile platforms. In South Korea, the nation launched its first civil-military dual-use communication satellite in August 2006, a move that introduced cutting-edge warfare systems in its overall capability. The dual-use satellite carries 12 military relay terminals and 24 commercial terminals, whereby the 12 military relays are capable of covering troop communications from the Malacca Strait to the Central Pacific sea areas. Prior to the satellites launch, the South Korean military relied on ground-based communication systems; however, the system using underground military cables or microwave relay towers was vulnerable to enemy attack. The dual-use satellite system has been successful thus far such that South Korea plans to deploy a total of 20 satellites, including eight multipurpose satellites, by 2015. One of the key benefits of dual use systems include reduced costs compared to internal asset build-up. A case in point is the recent budget challenges faced by the U.S. Militarys TSAT program, which took a serious hit in FY2009. This will have a dramatic impact on U.S. Military capabilities as the bandwidth the U.S. had planned on owning internally will be drastically reduced within the time frame set forth in the original schedule of the program. Dual-use systems or hosted payloads that also draw on commercial customers cost a fraction of proprietary assets. Even with payload and bus enhancements, where the costs of which are shared with the commercial operator or partner, the total price tag is far below deploying and owning a proprietary military system. The other benefit of dual use or hosted payloads is the speed by which assets are deployed. Even if TSAT were to be deployed based on the original scope of five satellites, the delays that are now expected to take place, where first launch has been moved from 2013 to 2016 at the earliest, means that bandwidth planning and systems capability will have to likewise be delayed. Barring other available alternatives, commercial outsourcing will once again have to take up the slack. These considerations appear to be in full view of the U.S. Militarys system planners. In July 2008, AGS announced that it was awarded a contract by the U.S. Air Force to host an experimental sensor on board a commercial spacecraft. The three-year $65 million firm fixed price contract will host the experimental sensor on board an SES AMERICOM spacecraft scheduled to be launched in 2010 and will operate over the United States. The program, known as the Commercially Hosted Infrared Payload (CHIRP) Flight Demonstration Program, will have the primary purpose of testing a new type of infrared sensor from geo-synchronous altitude. The passive infrared sensor will be integrated onto a commercial satellite so that it can be launched into orbit, and the data can then be transmitted to the ground for analysis. Although the CHIRP program is for experimental purposes only and also not designed to address the communications mission and bandwidth shortfall faced by the U.S. Military, one cannot help but ponder whether the next line of contracts coming from the U.S. Government will be for dual use satellites similar to the Australia and South Korean models or for hosted payloads. The impetus is there, having granted a contract to SES and discussions are more prevalent from both the military side as well as the commercial operator side. For the military, cost and speed provide compelling arguments to deploy a dual-use or hosted payload satellite system. For commercial satellite operators, cost-sharing, long-term contracting and an anchored tenant provide invaluable benefits in a business that is inherently risky given the 15-year life of the asset. In 2008, Pentagon leaders disclosed that non-traditional conflicts such as the insurgents and terrorists facing coalition forces in Iraq and Afghanistan will be the main military battlefields for years to come. The classified Pentagon assessment likewise concluded that the U.S. Military in many respects including its bandwidth resources is prevented from improving its ability to respond to any new crisis such as potential outbreaks in North Korea, Iran, Lebanon, or China. NSR understands that militaries around the globe in general and the U.S. Military in particular prefer to own and control its own communications assets for security and reliability. However, given the budget challenges and scheduling requirements, commercial outsourcing coupled with hosted payloads or dual use satellite programs may be the bitter pill the military has to take in order fulfill its missions and enhance its capabilities in the next decade. Mr. del Rosario covers the Asia Pacific region and is a senior member of the consulting team where he focuses his research on quantitative modeling, data verification, and market forecasting for the wireless industry and satellite communications sector. He conducts ongoing research with specialization in policy analysis, regional economic indicators, regulatory initiatives and end user demand trends. In addition to authoring numerous syndicated reports in his areas of focus, Mr. del Rosario has been involved in a wide range of strategic consulting projects. He has advised clients on market trends, implications, and strategies on such diverse topics as WiMAX, mobile communications, mobile video, 3G offerings, terrestrial microwave services, IPTV, IP telephony, multi-mission satellite programs, launch vehicles, broadband equipment and services, Internet trunking, and Enhanced IP Services. Prior to joining NSR, Mr. del Rosario worked with Frost & Sullivan as Program Leader of the Mobile Communications Group, as Senior Analyst & Program Leader of the Satellite Communications Group, and most recently as Country Manager for the Philippines. Prior to that, he was the Public Affairs Officer of the European Commissions Delegation in the Philippines, co-managing the Commissions programs on economic cooperation and development assistance. He also performed economic and political risk assessment of the Philippines and ASEAN, for use by Delegation officials in the Philippines and in the Commissions headquarters in Brussels. Jose also worked as a congressional aide for the Malaysian Embassy and as a telecommunications legal researcher for Irwin & Lesse in Washington, D.C.
Mr. del Rosario holds a Master of Arts degree in Applied Economics from The American University, and a Bachelor of Science degree in Political Science/International Relations from the University of Santa Clara.